“Island.” Close your eyes and the mere mention of it calls to mind the image of a luxurious expanse, distinct from the rest of its surroundings—a destination. Oh yes, the lure of the islands is real, and a kitchen island is one of the most popular elements in kitchen design today. 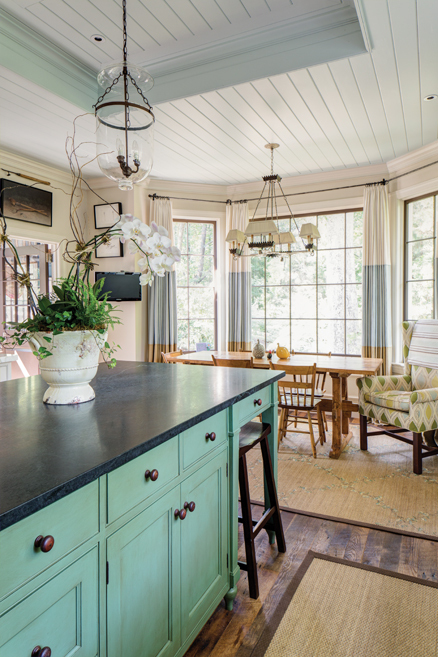 Used for cooking, dining and even homework—the kitchen island might just be the hottest spot in the entire house. 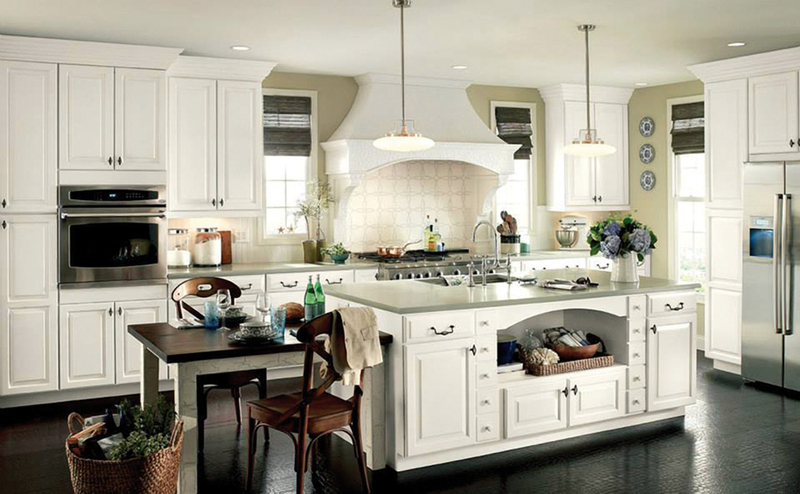 Chris Hargis of Pinnacle Cabinetry and Design says the idea of having a central worktable in a kitchen isn’t new, but when the popular “open floor plan” made the kitchen an official part of a home’s entertaining space, homeowners began to see their kitchens as a room that was equally worthy of both function and style. When kitchen islands first came on the scene, there was a trend of putting the cooktop and its related under-counter pot and pan storage in the island. The island cooktop was an extension of the kitchen’s work triangle—detached from the perimeter, giving cooks a little more room to maneuver in the kitchen. However, many homeowners now prefer that their kitchen sinks and dishwashers be placed in the island, instead. Over time, homeowners began to notice that they were spending a lot of time working at their sinks with their backs turned to the rest of the room. Hargis explains that we spend most of our time in the kitchen preparing to cook, or cleaning up from cooking. Of all island sink styles, Hargis says the apron front (or “farmhouse” sink) is the most popular style because of the way they’re installed. Apron front sinks sit slightly forward on the cabinets, versus traditional standard sinks that are dropped in a hole cut into the countertop, so they don’t need extra inches of countertop in front of them. Those extra inches can become useable counter space on the other side. So, when homeowners relocate their cooktops to the perimeter of the kitchen and bring the kitchen sink to the island, they can solve several problems in their kitchen’s workflow, with the added stylish result of gaining two focal points. 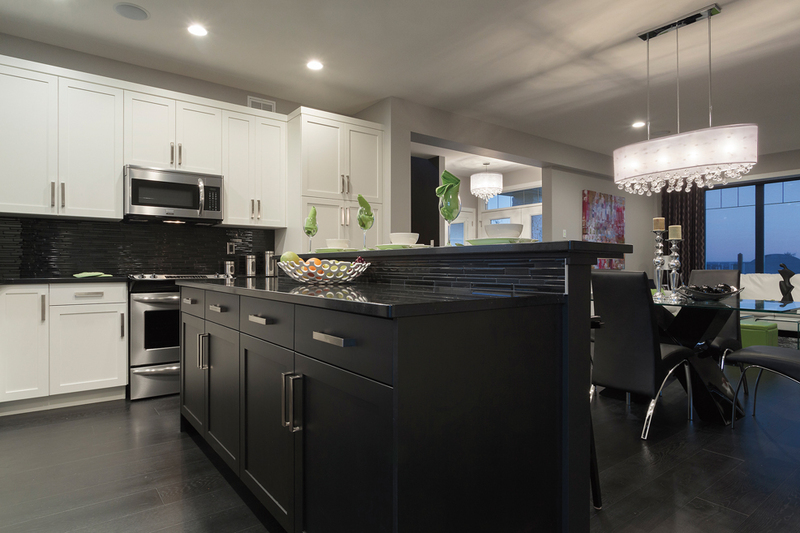 The island itself becomes a focal point, especially with attractive pendant lighting hanging over it, and a decorative canopy and backsplash installed over the range become another attractive view to highlight the space. At one time, two-tiered islands were popular, with an upper countertop installed for barstool-height dining. Homeowners liked having the visual shield that the upper level provided between the living room and the kitchen, but the issue with this design was that, in most kitchens, this dual surface arrangement dipped too far into the already-crowded prep space around the cooktop. Homeowners were left with a long, skinny shelf that wasn’t very comfortable for dining after all, and very little usable counter space around their cooktops. Because of lessons learned in those early open-kitchen designs, most new kitchen islands now feature a single-level work surface. John Eggleston of Spectrum Stone Designs says this new, single-level layout has made the kitchen island more versatile. “Islands are the main attraction in the kitchen and we expect a lot out of them. They’re extra prep space, an eat-in kitchen, a buffet and a wet bar during a party, and a place for the kids do their homework while dinner’s being cooked,” he says. He says that granite is still the most popular kind of countertop, with manmade solid-surface quartz-based materials made by Cambria and Silestone requested almost as often. He says that white is still the hottest color for the perimeter, along with light grey. 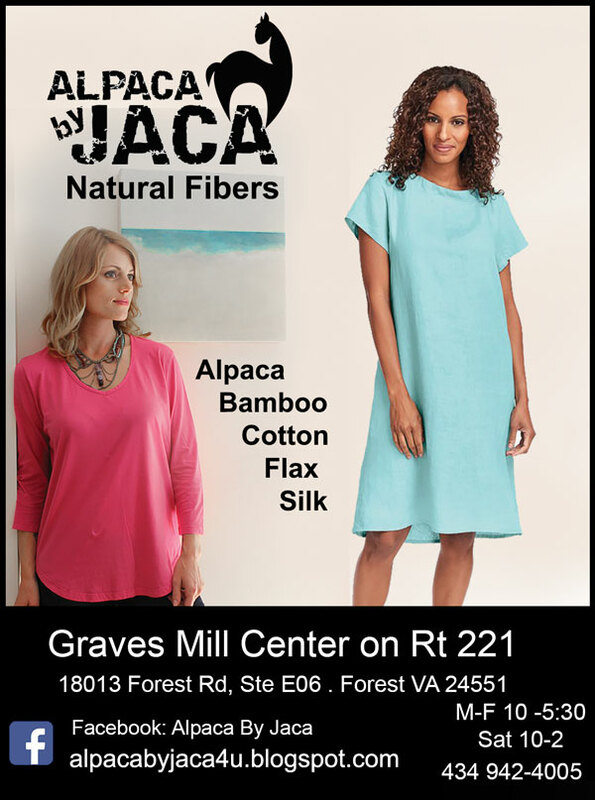 On the island, he says he often uses shades of blue, green and even red. Hargis says that some homeowners achieve a bolder look for their island by using dark stained wood or even something exotic like zebrawood. Eggleston also says that most homeowners don’t want “big rectangles” in their kitchens anymore. Whether he’s doing a complete island replacement or replacing and upgrading an island countertop, he says he often adds rounded countertops for the seating area at the extension of the island, both to provide a designated dining spot and to help transition the island into the family room’s décor. He says that homeowners like being able to use standard-height stools and kitchen chairs at these extensions on their new multi-use, single-level islands. With most new kitchen islands offering even more than just a site for meal prep, cleanup and casual dining, many homeowners are installing conveniences like refrigerator drawers for the kids’ snacks, recycling centers and even pet feeding stations in their islands. Since many cooks now search recipes on their digital tablets, they no longer need the bookshelves that were once a standard island feature. However, homeowners now need an abundance of electrical outlets, thanks to all their handheld electronic devices. To meet this new demand, many homeowners are requesting drawers equipped with multi-outlet power strips so they can charge all their electronic devices under the counter, where they’ll be safe from kitchen spills and splashes. Eggleston says that a few years ago in the kitchen design industry, there was a running joke that kitchen islands had grown into continents. But he says recently he’s seen the pendulum swing in the other direction, as many homeowners want smaller, more compact and efficient kitchens. With that in mind, Eggleston says that islands don’t have to be huge to be useful. 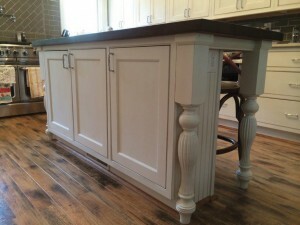 He says that small butcher blocks are making a comeback and that some homeowners are even requesting their kitchen island to be mounted on casters so they can keep the island in the room when they need the worktop, and roll it out of the way when they want the open space. 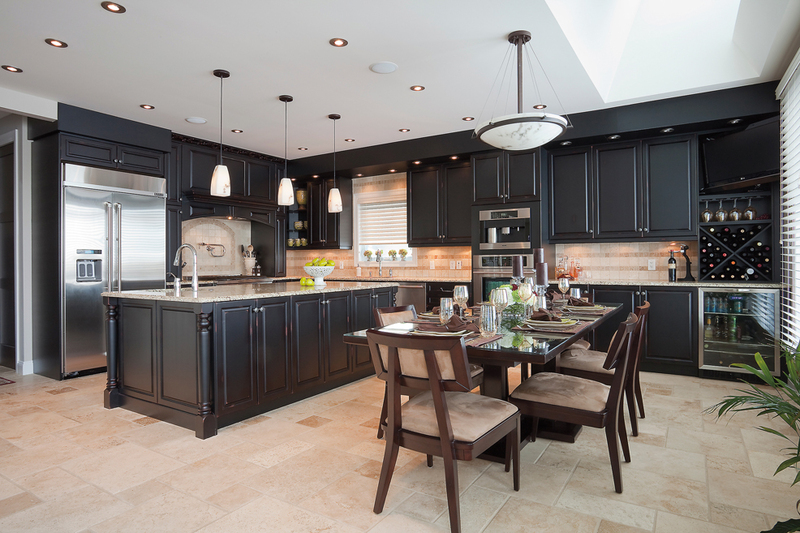 There’s an ideal kitchen design for everyone and many can accommodate a kitchen island. Kitchen islands aren’t one-size-fits-all features; they can be customized to suit your needs and fit any style of home décor. 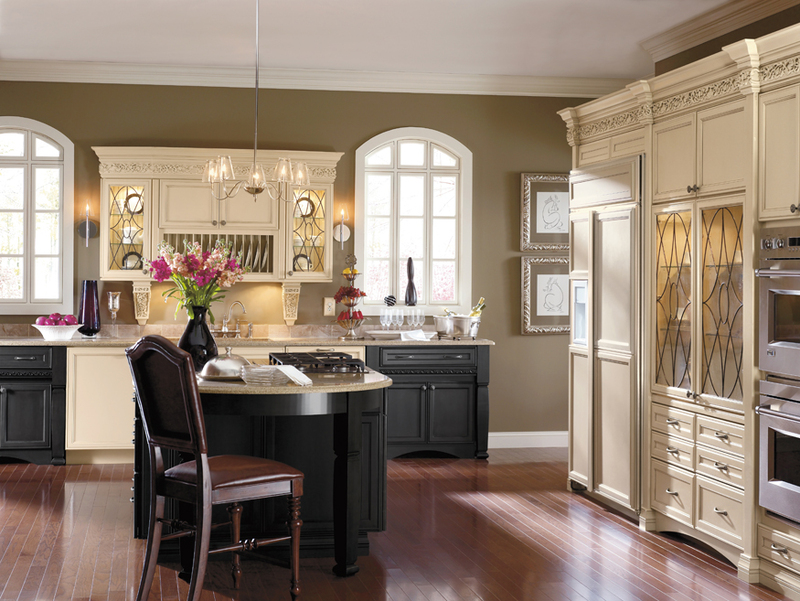 The kitchen island is the center of activity—how you spend your time there is entirely up to you.